Thank you in advance for your interest in our AMR Volunteer Guides and Cooks Program. At present, AMR Lodges consists of 6 Lodges and 20,000 plus acres located in Brady, Caddo, Menard, Fort Mckavett and Eldorado Texas. We serve our members and their families that have purchased private hunting lodge packages. We try to staff a minimum of 3 people at each location during our adventure sessions. (Host, Cook and a Guide). Each Property has the Capacity to Serve up to 16 people. 1 Session = 2 nights of lodging. (Example: Arrive Wednesday after 2 pm. hunt that evening, stay Wednesday night, Hunt Thursday morning afternoon and evening and stay Thursday night. Hunt Friday Morning and depart by noon on Friday) Same goes for a Friday thru Sunday Morning sessions. 7-9 AM Members out in the field and return on their own or with guide with harvest, Guides help clients with harvest recovery and processing of game, Cooks provide Hot/Cold Breakfast Buffet to Members. 10 AM Cooks and Host clean Kitchen, Guides continue serving Members in field and at lodge. 12 pm. Change over Days are Fridays and Sundays. Members leave before noon. Cooks, Guides and Hosts Clean Lodge, Strip Beds do laundry and make ready for new Member arrivals after 2 pm. 2 pm. On Arrival Days : Wednesdays and Fridays Host and Guides welcome in new arrivals and do Property briefing, safety instructions/ range instructions (zero guns) and release paperwork. 7 – 8 pm Dinner Served. Cooks Clean Kitchen and set out Dry Breakfast for following day. Guides help Member retrieve and process harvested game. ALL VOLUNTEERS MUST REFRAIN FROM DRINKING ALCOHOL OR SMOKING WHILE SERVING. YOU MUST BE ABLE TO PASS A BACKGROUND CHECK IF REQUESTED. NO FOUL LANGUAGE IS ACCEPTED. 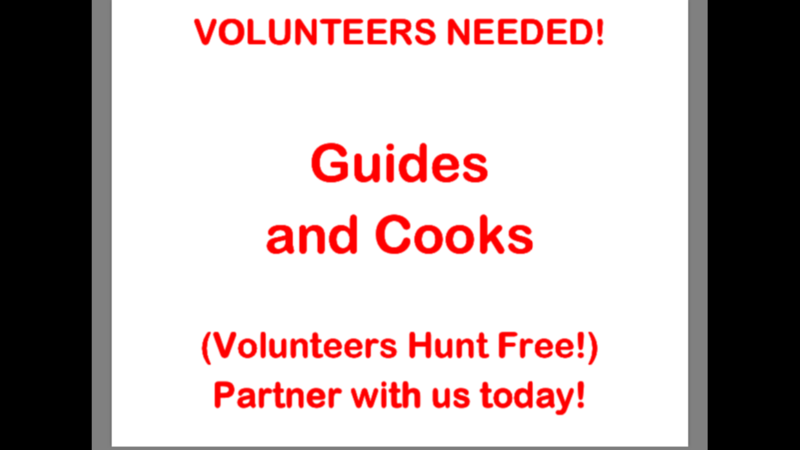 Volunteer Cooks have access to a fully stocked kitchen and supplies. Must be capable of preparing a Simple Breakfast, Lunch and Dinner Menu. Normally cooking for groups from 2-12 persons. Also required to help clean lodge and strip beds. Volunteer Guides have access to ranch vehicles and processing facilities. Must be able to retrieve harvested game, along with skinning, quartering and trophy prep for customers. Fairly accurate Aging of Whitetails on the hoof is a must… Also required to help clean lodge and strip beds. Volunteer Hosts help coordinate Cooks, Guides and Members during their stay. Hosts are responsible for the smooth operation of the entire property and must receive training under another Host prior to being able to Host on their own. Serving as a volunteer is AWESOME! You will enjoy the satisfaction of helping others in the outdoors under a very Family Friendly environment. YOU will be allowed to keep any tips that you receive during your service. 2 days of volunteering = 1 night stay and harvest of a whitetail or axis doe. 6 days of volunteering = 2 night stay and harvest of a whitetail buck and 2 doe (no guests). 8 days of volunteering = 4 nights of lodging and 1 exotic male or whitetail buck and 2 doe, 1 Guest Allowed to come with you and share your harvest. 12 days of volunteering = 8 nights of lodging for you and your family with harvest of 2 male and 2 female animals. Immediate family or 1 guest is allowed to come with you and share your harvest. We look forward to serving with you. Should you have any questions. Please call us at 800-277-1647 or email us using the form below.